If there's one thing in my new house that becomes a topic of interest whenever family and friends come to visit, it has to be.... the refrigerator. 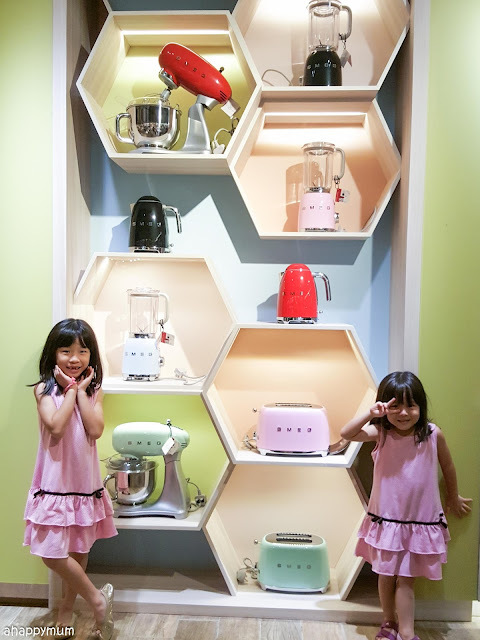 Some of them were impressed by the design, some didn't even realise it was a fridge, some were curious about the functions but undeniably, they were all blown away by the sleek, retro design. 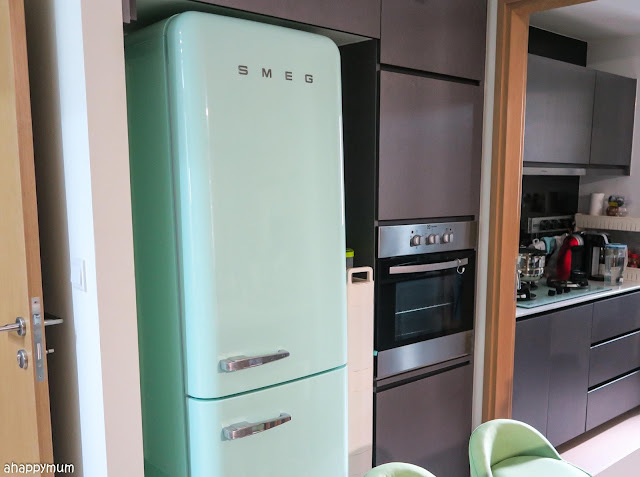 A beautiful, elegant high-end fridge that dominates my kitchen and stands out in my favourite pastel green colour - there's really nothing else that beats it and I'm so thankful that my dream fridge is now a dream come true. 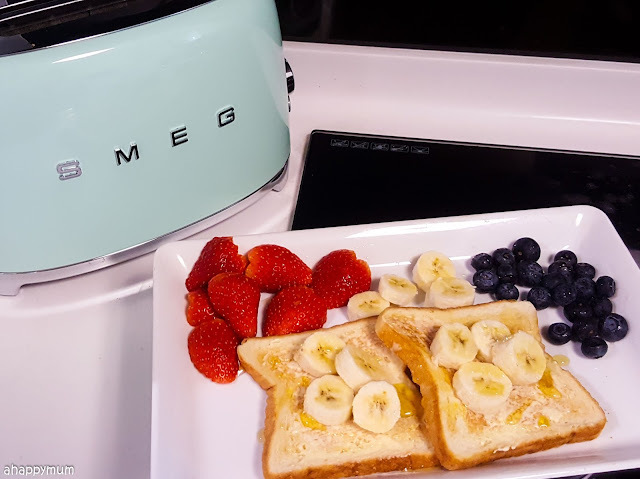 In today's post, I'm sharing our review of the Smeg FAB32 fridge and will be letting you take a closer look on the inside, plus I'll also be telling you more about the stylish looking, perfectly matching Smeg small appliances which will jazz up every kitchen. 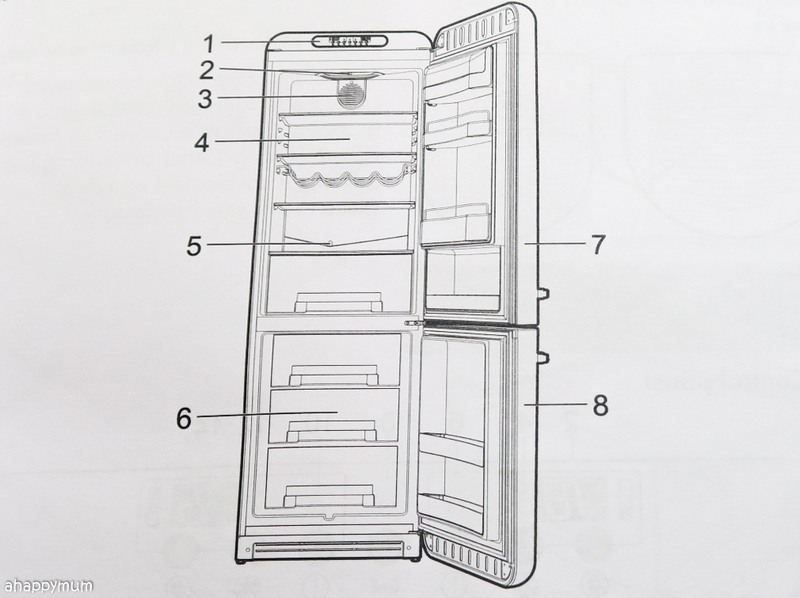 I've always preferred a fridge that has a bottom freezer compartment instead of top. 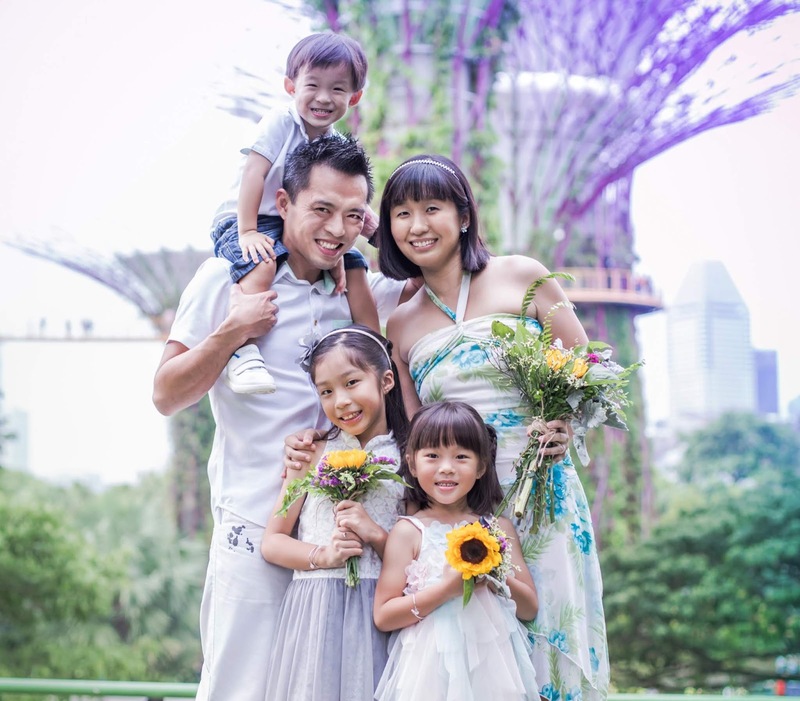 While this means that the kids might be able to reach for ice cream on their own, it also grants me quick and easy access to all of the fresh food compartment, which is used much more often than the frozen one in our home. Yes, this means I can stand upright most of the time instead of having to bend over and as a stay-at-mum who usually has a toddler on her chest, I appreciate that very much. 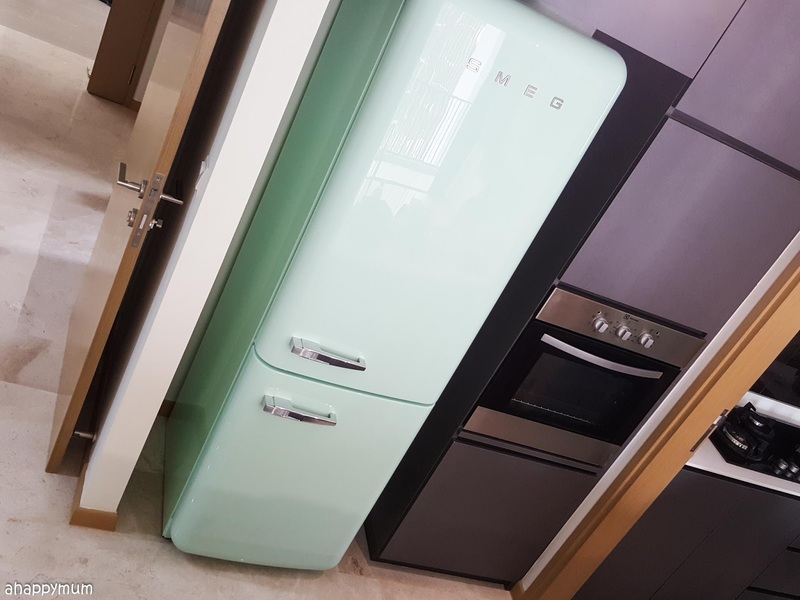 The Smeg FAB32 double door refrigerator with a bottom freezer is my ideal choice because with its iconic 1950s design, bold finishes and soft round curves, it is a stunning beauty which lights up the otherwise monotonous kitchen. 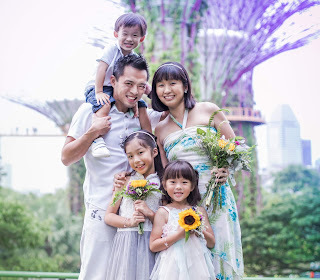 Some have asked if the fridge is big enough for us, considering that we have three little ones in the house and we cook at home every other day. Measuring 600mm (W) x 720mm (D) x 1926mm (H), the FAB32 fridge does look slim and tall but it is a bigger, upgraded version of the FAB28 and FAB30 series. It might not be the largest fridge we've had so far but it does suffice for our family of five, especially since I go to the supermarket thrice weekly and prefer to get fresh supplies instead of storing them for a prolonged period of time. Now that we've seen the outside of it, I'm sure you want to know more about the inside, right? Let's take a closer look, shall we? 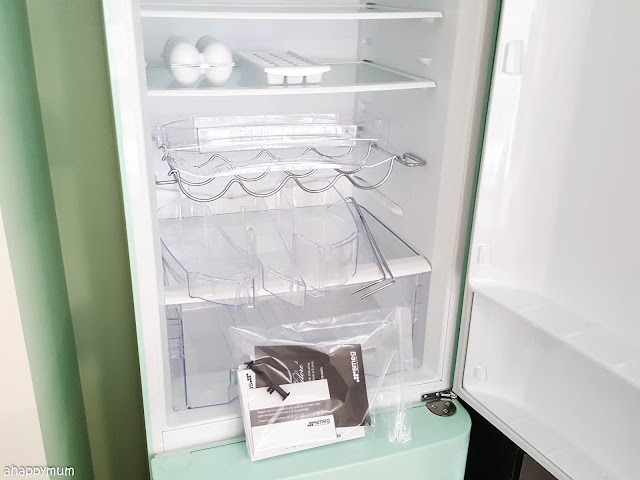 The freezer compartment consists of three freezer drawers while the main refrigerator compartment comes with accessories including shelves, fruit and vegetable drawer, bottle rack, door balconies and shelves, egg holder and ice tray. This was exactly how the interior looked when the fridge was delivered. 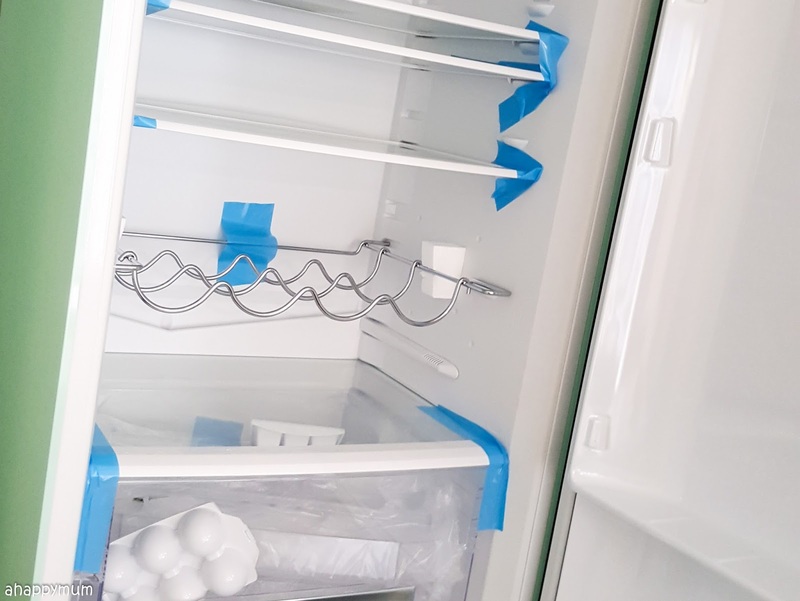 The accessories were held in place using the blue tape so that they wouldn't move about when you shift the fridge in place. By the way, the fridge weighs a ton but it has two wheels at the back for ease of movement. It didn't take me long to set everything up and while I wished that the egg holder could hold ten eggs instead of six or that there was an ice box in the freezer for me to store the ice cubes, I did love all the other accessories, in particularly the bottle rack that helps to store four 1.5L bottles neatly and the door balconies which are apt for small containers, dairy products and small bottles. The best part is you can position the shelves and the rack to suit your needs and they come with safety fittings (you need to lift up the front part before you can extract them fully) to prevent accidents. Here's a peek into our fridge when it was just stocked up! 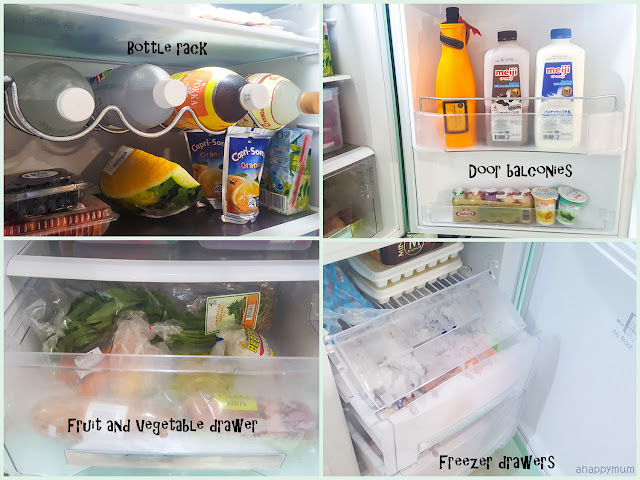 I like how there is ample space to store our fruits and vegetables in the huge drawer, how we can reach our bottles easily thanks to the bottle rack, how the door balconies and shelves create more space and how the freezer drawers make it easy to compartmentalize and retrieve the frozen food. Oh, and guess what? It's a no frost freezer, phew! That means it auto-defrosts and ice doesn't collect on the surface. Yup, don't get me started on how we needed to defrost the freezer and wait for ages for the ice to thaw at my mum's place when I was a kid. 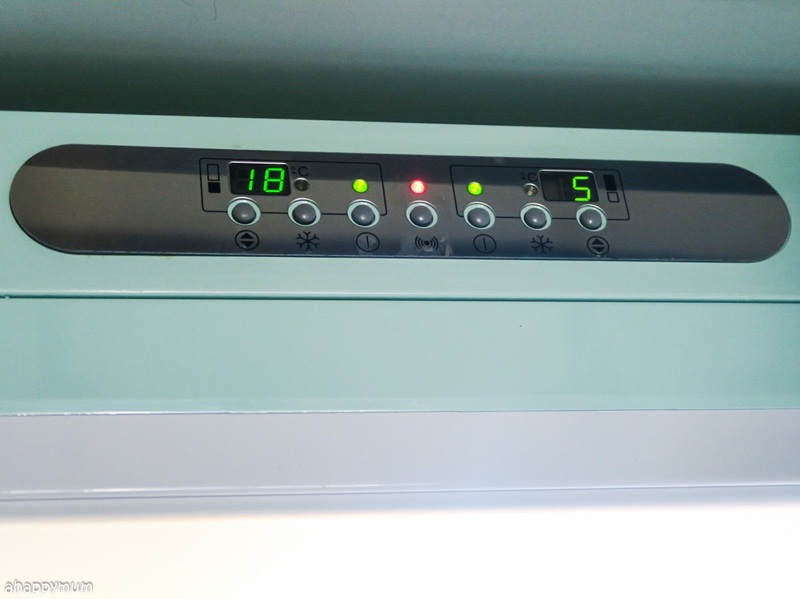 A cool feature of the FAB32 is the control panel which sits at the top of the fridge so that the kids will not be able to activate the buttons. There is an alarm which sounds when the temperature gets too high or when the fridge door has been opened for more than a minute. Yes, no more worries of forgetting to close the fridge door or if it has been accidentally left ajar. 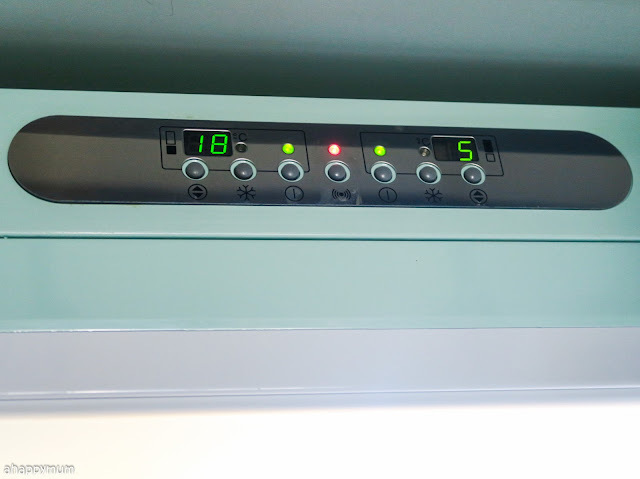 There are also thermostats for you to easily adjust the temperatures in the freezer and fridge, both of which are displayed on the screens. If you ever need to switch off the fridge or freezer, there are individual buttons for them too so it won't affect the other. 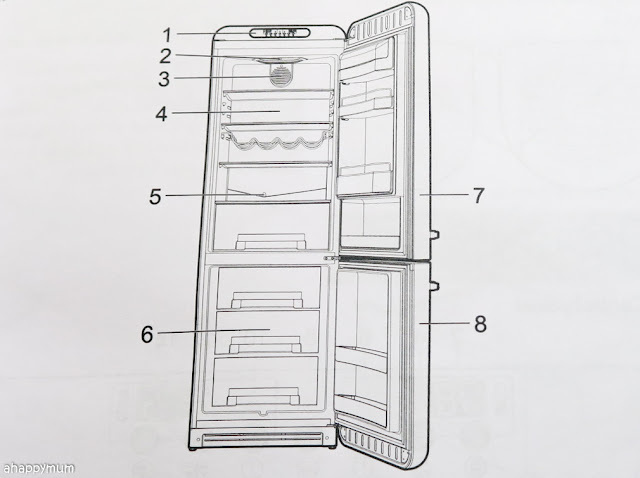 In addition, the Super Cool Fridge function allows you to quickly cool large quantities of foodstuffs while the Super Freeze Freezer function lets you freeze large quantities in a short period of time. That's really quite cool, right? So far, the fridge has been working great for us in the past couple of months. It's sleek, it's functional, it's a good size, it's efficient, it's a total delight to have in the kitchen. It's not that I don't want to point out anything negative about it but I seriously can't think of any reason not to love it. For now, at least. Moving on from the fridge, we are loving our small domestic appliances from Smeg - namely the toaster and kettle, in matching pastel green colour, of course! 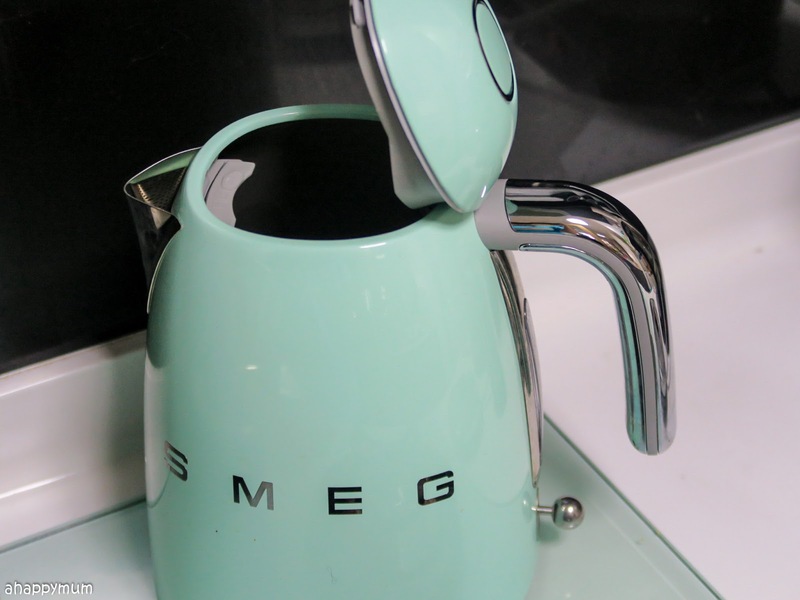 Seriously, how pretty can these retro style appliances get? I love how they instantly add charm and personality to my kitchen counter. Launched at the end of 2016, the Smeg small appliances collection consists of a toaster, blender, kettle and stand mixer and they come with homogeneous elements including an enamel-coated stainless steel body, curvy base, sophisticated control knobs and the iconic retro logo. Perfectly matching, stunningly stylish. I love the pastel green but there are also other gorgeous colours to choose from, namely black, red, cream, pastel blue and pink. If you were to ask me, all of these Italian-designed appliances just look so appealing and attractive in their own ways and every colour has its own merits. Can you make up your mind on which is your favourite yet? 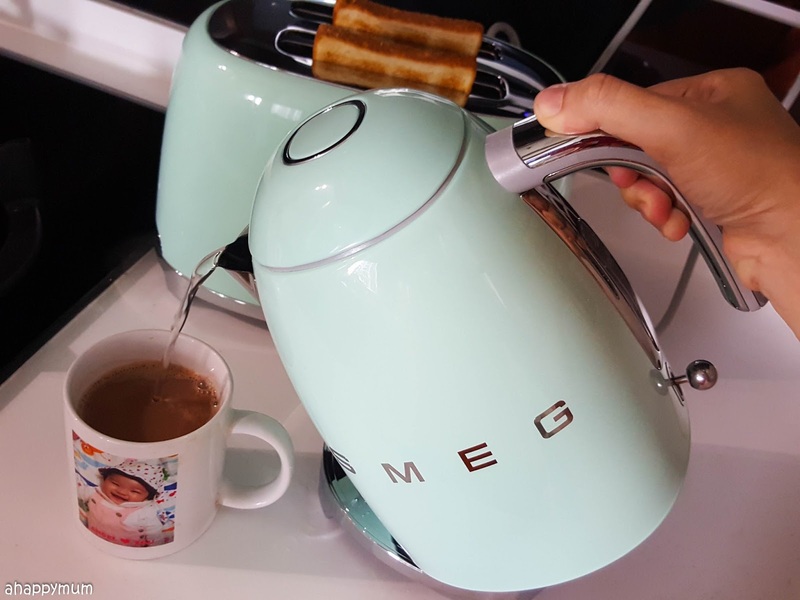 The Smeg kettle is a natural charmer and its 1.7L capacity is perfect for our family's needs. Yup, I usually only need to use it once a day although I wouldn't mind doing it more often since it's so pretty to look at and easy to operate. It comes with anti-slip feet, soft opening feature and a 360° swivel base for convenient usage. To open the lid, all you need to do is push slightly and it opens progressively, which helps to prevent any sudden release of steam. The spout, which is made of stainless steel, is large enough to allow water to be poured easily without spillage. The kettle also boasts a limescale filter function to filter the deposits, giving you calcium carbonate-free water. 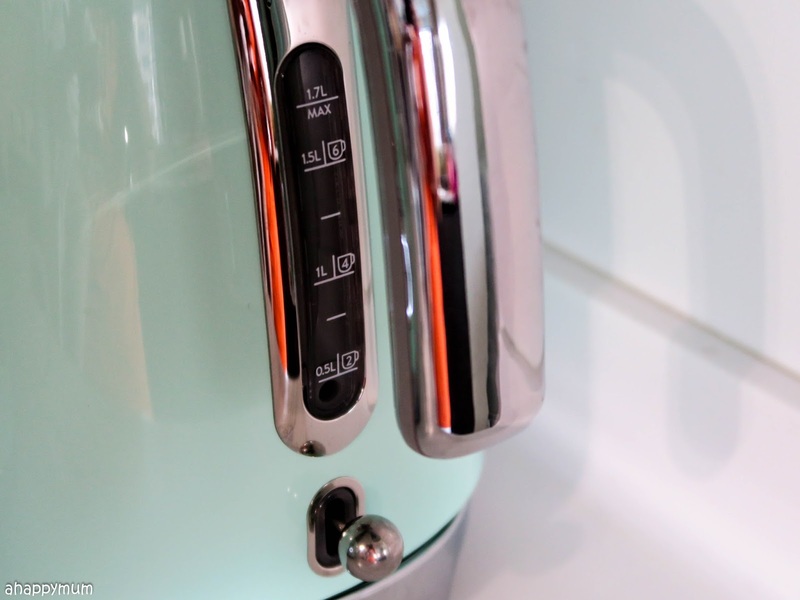 The water indicator level clearly shows the amount of water in litres and cups, and when you start the boiling process by pushing the level downwards, there will be a white LED light that turns on too. With a power of 3000W, you can be sure that water heats up swiftly and efficiently. 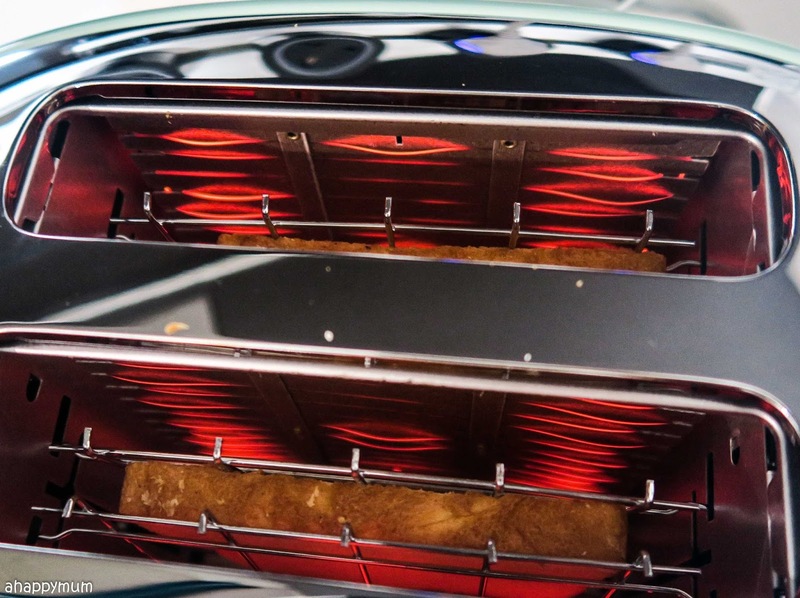 The Smeg 2-slice toaster comes with two extra wide slots, self-centering racks, 6 browning levels and 4 functions on the control panel. You can Reheat cold or unsatisfactory toast, Defrost frozen bread, toast only one side of Bagel or Cancel the toasting process anytime - all at the touch of a button. To toast, all you have to do is set the browning level and push down the lever. Easy peasy! I've never owned a toaster before so I didn't realise how handy and easy to use it can be. We now have more options for breakfast and making yummy, hot toast is a breeze. 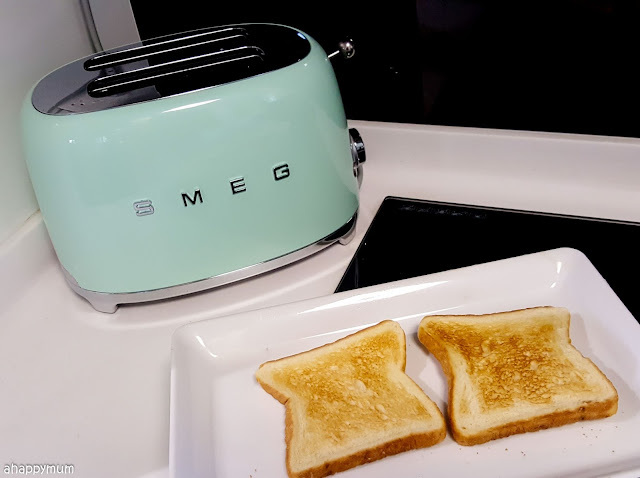 The Smeg small appliances are not just a joy to look at but a joy to use too. 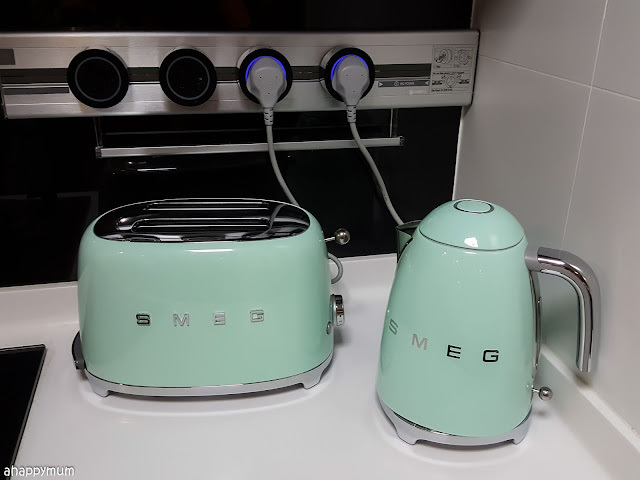 Yes, we are totally in love with our Smeg 50's Retro range and they are now the biggest, brightest stars of our kitchen. Technology doesn't have to compromise design and seeing how these high-end, innovative appliances are bursting with style, I think they are definitely worth the investment. Disclosure: This is a semi-sponsored review. We received a special price for the fridge and the small domestic appliances are kindly sponsored by Smeg. All opinions are our own. So cute! Really brightens your kitchen!